REDSTONE ARSENAL, Ala. -- Fire prevention is a serious subject. But sometimes, you have to put a fun spin on it to get the message across. 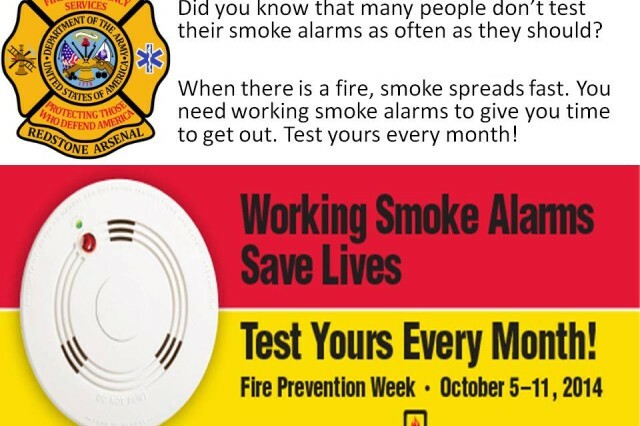 That's what Redstone firefighters will be doing Oct. 9 as they take their message of fire prevention to the Redstone Housing community during national Fire Prevention Week. Beginning at 5 p.m., the Redstone Fire Department will hold its second annual Fire Safety Night for residents of Redstone. The evening will include a fire department parade through the housing area, a cookout with hamburgers and hot dogs, and toys for the kids. Children and parents will be able to experience the effects of a smoky room simulated in a mobile fire safety house provided by the Madison Fire Department. Sparky the Fire Dog will also visit with families. "We want to bring out the community to talk about fire safety. This event allows us to share our fire prevention message with Redstone families. It gives us a chance to interact with the families and especially the kids. 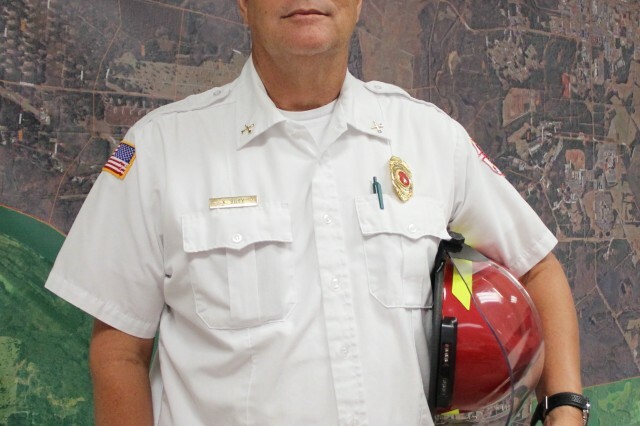 It's an important way we can get our fire safety message across to the community," said Christian Miles, a Redstone fire inspector. This week is Fire Prevention Week nationwide. 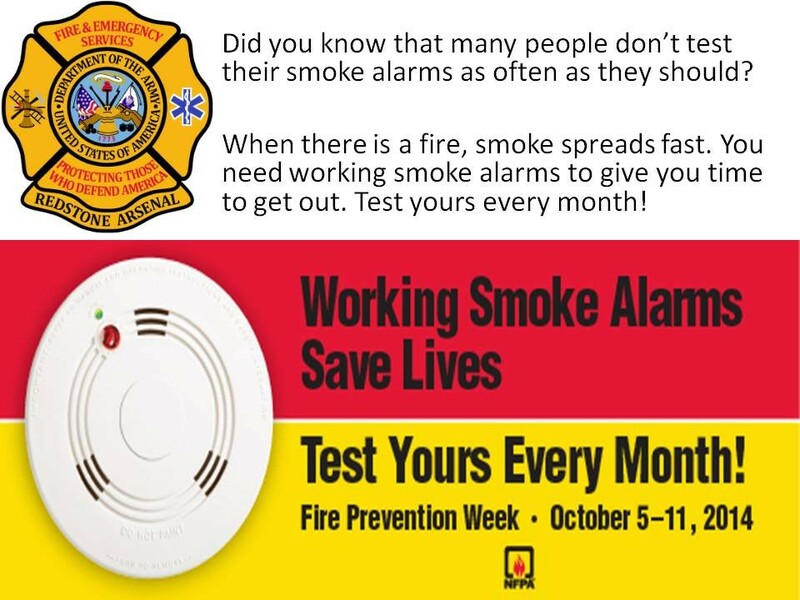 The theme for this year's awareness campaign is "Working Smoke Alarms Save Lives: Test Yours Every Month!" Last year, Redstone firefighters had a fire safety display at the housing community for Fire Safety Night. But they have expanded on that concept in a big way this year with the help of Redstone Communities. After fire trucks parade through Redstone neighborhoods, they will turn into static displays at the housing office, where children will be able to sit in the trucks and try on the fire gear. "We are doing this bigger and better than last year," Miles said. "We want to bring out the community in a big way and make our event more kid friendly. We want to bring out the families so that we can present our message of fire prevention. We want to show kids not to be scared of firefighters and fire trucks, and the best way to do that is by interacting with them in a fun way." Upwards of 200 Redstone family members are expected to attend the cookout. Firefighters will give away toy fire helmets and stickers, and other goodies to the children. There will be potholders, bags and fire safety brochures for adults. 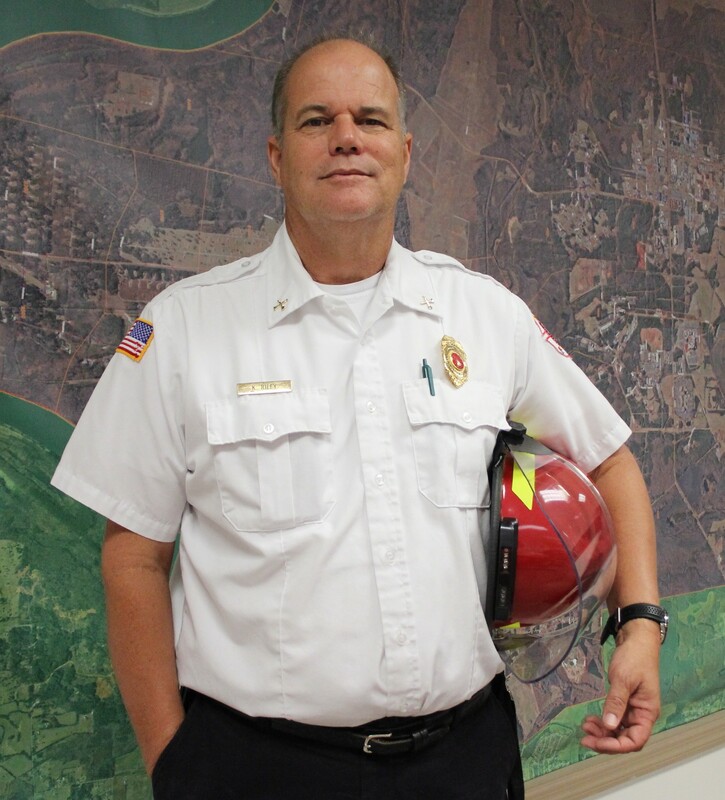 "We are hoping to bring the importance of fire safety to this community, and to meet the families we serve here at Redstone," Miles said. Smoke alarms will be a big part of the event, as they are an important tool to preventing fire deaths in the home. According the National Fire Prevention Association, having a working smoke alarm in the home cuts the risk of dying in a fire in half. On average each year, three out of five home fire deaths result in fires where there are either no smoke alarms or no working smoke alarms. In 23 percent of the home fire deaths, smoke alarms were present but did not sound. The NFPA recommends installing smoke alarms inside every bedroom, outside each sleeping area and on every level of the home, including the basement. They should be tested twice a year and their batteries should be replaced annually. Smoke alarms should be replaced every 10 years or sooner if they don't respond properly when tested. "The more warning you have, the better you will be able to respond," Miles said. Once a smoke alarm sounds, a family should quickly exit the home, even if they only see light smoke. If there is already heavy smoke in the house, parents and children should be familiar with getting low and crawling under the smoke. Children should know they should fight to get out rather than crawl under a bed or hide in a closet in fear. Family members should not spend time looking for pets. Instead, they should leave the burning home and leave the door open to give the pet the best chance to get out. 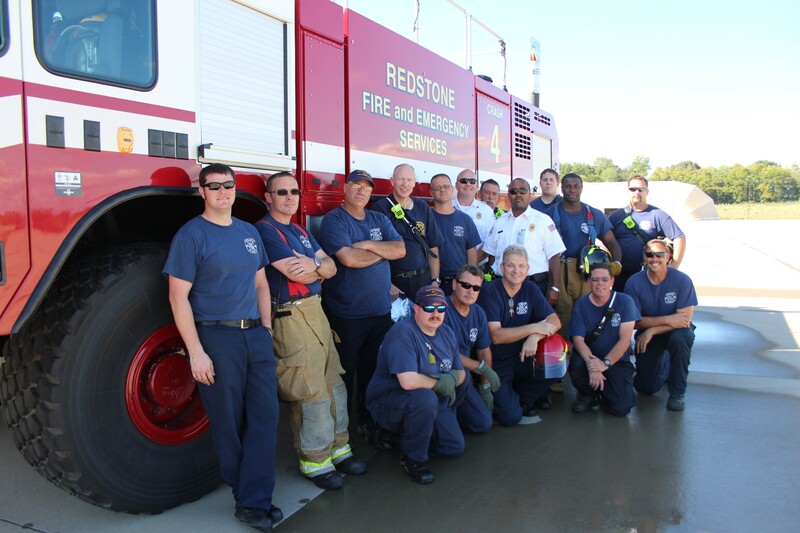 While families will be the focus at the Thursday event, the Redstone Fire Department also works to build relationships with the Arsenal employees who represent most of the constituents in the department's four fire station areas. Toward that end, the fire department offers monthly fire prevention safety classes at its training center in building 3545 on the second Tuesday at 8:30 a.m. and 10 a.m. Firefighters will visit tenant offices on post to talk about fire prevention with employee groups. For more information or to schedule a class, call 876-7005 or check out the Redstone fire department webpage at www.garrison.redstone.army.mil. The department also conducts fire drills at major tenant facilities on post, and at the Child Development Center, School Age Center and Youth Center. It will conduct a joint fire drill sometime this week at NASA building 4200 and its Sparky the Fire Dog has already visited the Goss Road CDC this week to talk with young children about fire safety. "We do fire evacuation drills at various times, and especially at the child care centers," said Ken Riley, the department's lead fire inspector. "Now, at the child care centers, when they see us coming, they know there is going to be a drill. So, we try to do things that will surprise them. Sometimes, I will activate a manual pull station to see what the response is. Other times, I will walk up to a teacher and say, 'The trash can is on fire. What do you do?'" During a recent fire drill at the Goss Road CDC, Riley did just that. He told a caregiver that a trash can was on fire. The caregiver pulled the fire alarm and everyone was out of the building in 1 minute, 30 seconds. The acceptable standard is complete evacuation in 2 minutes. "Unfortunately, the fire drill occurred at nap time, so the caregivers were not happy with me," Riley said. "They had to wake up a bunch of babies and put them in cribs to get them out of the building, but they did it in record time." Riley doesn't conduct the fire drills on a whim. They are required by nationally accepted standards set by the National Fire Protection Association in its Life Safety Code, which is the most widely used source for strategies to protect people from fire based on building construction, protection and occupancy features that minimize the effects of fire and related hazards. The Life Safety Code provides requirements for building egress and such fire protection features as sprinkler systems, alarms, emergency lighting, smoke barriers and special hazard protection. The code sets monthly fire drills for child care centers and regular fire drills for large buildings housing a large number of employees. Buildings with a small number of employees do not require fire drills. To be an effective fire drill, surprise is important. How employees react to the surprise of a fire alarm can make a difference when evacuating a building safely. "Each building with 10 or more employees must have an emergency action plan and its own criteria for evacuation depending on the size of the building," Riley said. Emergency action plans are dictated by the Occupational Safety and Health Administration. When conducting fire drills for Redstone tenants, Riley works with facility managers to ensure a drill is scheduled at a time that doesn't harmfully impact mission support. "Large buildings need to have a fire drill annually," he said. "But in many of our large buildings, employees are working on critical programs, and we don't want to disturb them at a time when we could increase potential harm to a program. It can still be a surprise to the employees, but we want to make sure managers and supervisors have the knowledge needed to protect critical programs." During a fire drill, employees are timed for how long it takes the building to be evacuated and all employees accounted for by management. In the case of large buildings like the Wernher von Braun Complex, the Army Materiel Command headquarters or the Sparkman Center, it can be quite an effort to evacuate the building quickly and efficiently. "We will walk through to make sure everyone is out," Riley said. "There's a lot of apathy about fire alarm drills. A lot of times, instead of evacuating, employees will ask their co-workers, 'Is this a drill or a real fire alarm?' The answer doesn't really matter at that point. If the alarm goes off, you need to evacuate the building." Just like in a home fire when a family designates the mailbox as a rallying point for all family members, each supervisor should have a rallying point for their employees when evacuating a building. "Supervisors have to account for all their employees. They report that accountability to a designated head person, who then, in turn, reports to the chief firefighter on site," Riley said. While it's important to conduct fire drills in a home environment with children so that everyone knows what to do in case of a fire, it's also important that employees know how to properly exit a building that's on fire. "Everyone who works here is an adult and knows they need to leave a building if it's on fire," Riley said. "But they may not know where to go once they are out of the building or how they should exit the building. That's what a drill is for. Wherever they are when the alarm goes off, they should exit the closest exit, even if it's not necessarily the door they come in when they go to work." When the fire alarm sounds, there may be some employees who panic and may not know how they should exit the building. Other employees may be hesitant about going through security doors. Some may forget where the closest stairwell is and some may try to use the elevator. "The official answer to all scenarios is to get out," Riley said. "A drill can help people work through their panic and find their way out. It can give them the confidence they need to keep calm if a real fire does happen." In the case of mobility impaired personnel, they need to know the area of refuge where they are to go until help can get to them. Firefighters respond to fires differently when people are unaccounted for, whether in a house fire or a building fire. "That's why rallying points and accountability are so important," Riley said. "It's very important to let the incoming fire department know if everybody is evacuated. If we know someone is in a burning house or a burning building that will completely change our priorities and strategies. We risk a lot to save a lot. If somebody is in a burning house or a burning building, we will risk a lot to get to them." It's a serious subject in a nation where, in 2013, there was a civilian fire death every two hours and 42 minutes, and a civilian fire injury every 33 minutes, according to the National Fire Protection Association.